Bitcoin (BTC) prices have fallen consecutively for more than three months. According to CoinDesk's Bitcoin Price Index (BPI), Bitcoin closed at $6,320 on October 31, which is down 4.32％ from the opening price of $6,606 on October 1. Similarly, in August and September, Bitcoin prices fell by 9.22% and 5.8% respectively. However, in the month of November, analysts are expecting prices to rebound. 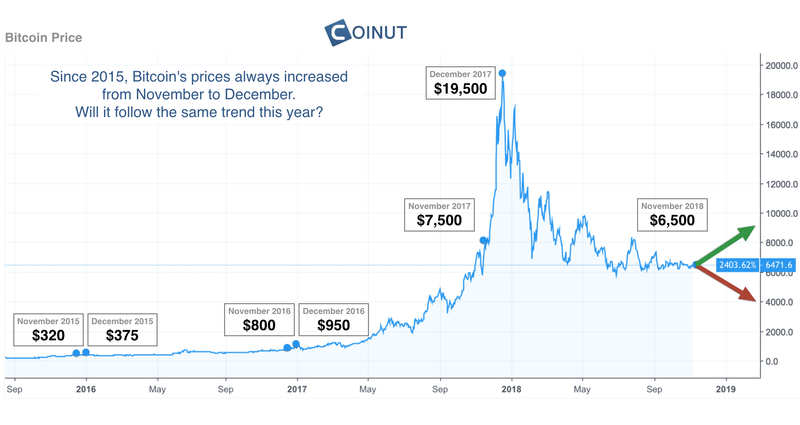 Since the burst of the cryptocurrency bubble in 2017, Bitcoin has moved on a downward spiral throughout 2018. However, based on previous price movements of the past seven years, analysis show that Bitcoin usually enters a bullish trend from November to December. From 2011 to 2017, starting from November every year, Bitcoin prices have always shown an upward trend. As shown above, Bitcoin rose by 17% at the end of 2015 and 18% at the end of 2016. Particularly, in November 2017, Bitcoin showed an increase of 67.5%. It is also worth noting that the best monthly performance of Bitcoin’s history was marked by a staggering rise of 467% in November 2013. Therefore, if this trend is repeated, Bitcoin price is likely to rally on a bullish run next month. In addition, investors should also pay attention to the symmetrical triangle shown in the diagram above. As seen above, prices are now very close to the tip of the triangle. Currently, Bitcoin prices are facing strong resistance at the upper edge of the symmetrical triangle at $6500 (first week of October). According to the symmetrical triangle, prices are expected to soar after breaking the initial resistance level at $6,750. The prices will then fall to the support level of the symmetrical triangle before it rebounds again. The ideal target zone will be between $7,381 and $7,636 in December. According to Bitcoin's fundamental analysis, there are several factors that could affect current prices. Recently, many large organizations have entered the cryptocurrency industry. For example, the Hong Kong Stock Exchange announced the preparation of a blockchain trading platform and also announced the regulatory framework for a cryptocurrency exchange fund. Additionally, Goldman Sachs is planning to open a cryptocurrency trading platform and is considering a custody offering for cryptocurrency funds. South Korea's largest commercial bank, Shinhan and Woori, also continues to support cryptocurrency transactions. These developments in the cryptocurrency and blockchain industry will have a positive impact on the price action of Bitcoin. However, some analysts believe that there is negligible changes in trading liquidity due to the limited participation by retail investors, which could limit the movements of Bitcoin prices. Nevertheless, as larger industry players continue to enter the cryptocurrency market, Bitcoin will definitely see a spike in trading liquidity and volume. This is because these organizations have a greater ability to hold larger investments for a prolonged period of time which would have a greater influence over the price action of Bitcoin.